ACDID31599 ACDMA97 ACDCA25369 ACDSEP ACDSP ACDTY9 ACDGC PeSAMember. 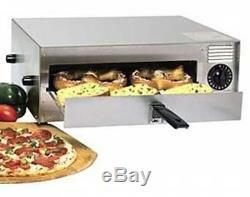 Wisco Counter Top Commercial Electric Pizza Oven 12 Frozen Pizzas - 412-5-NCT. Low Price Guarantee On All Wisco Products! Wisco Counter Top Electric Pizza Oven This counter top oven was designed for the express purpose of cooking frozen pizzas. It can also be used for preparing other frozen prepared food products such as egg rolls, and other food items of a non-greasy nature. Capacity: One 12 Pizza Material: The outer housing and grill front are made of 22 gauge brushed 430 stainless steel. The inner housing and other parts of the oven are made from aluminized steel for corrosion protection. Operation: Pizza should be kept frozen for best results. Capacity is one 12 inch pizza at a time. Oven can be turned on just prior to placing the pizza into the oven. After placing the pizza in the oven, set the timer dial to the desired bake time. The timer dial must always be turned past the two minute mark to activate the switch. Baking time varies depending up the thickness of the pizza. The average time is between 8-12 minutes. It is recommended that the drawer be opened at the 10 minute mark to check on the progress. Other Related Items from ACityDiscount. See more items related to. This website is operated by ACityDiscount, a division of Peach Trader, Inc, a Georgia corporation. ACityDiscount strives to create a positive experience for all our customers and welcomes your suggestions. We value our reputation and hope you will give us the opportunity to proactively address any concerns you may have. ACityDiscount may update these Terms and Conditions at any time. We will revise the iteration date at the bottom of this page to reflect the most recent update. We encourage you to frequently check this page for any changes. You accept responsibility for checking applicable state and local codes and for ensuring items meet those codes before purchasing. You will not hold ACityDiscount responsible for anything not stated in the listing or included in the picture, including, but not limited to, assumptions made by you or any verbal statements. If you are ordering from outside the US or intend to pay with a card drawn on a foreign bank, please contact ACityDiscount. Merchandise must be assembled, installed, and adjusted by knowledgeable, licensed, authorized and experienced personnel. There are NO WARRANTIES of merchantability or fitness for a particular use. Failure to notate any defects could result in a significant reduction in the carrier's liability during damage claims. You are responsible for filing any loss or damage claims in the manner and time frame directed by the carrier. ACityDiscount's customer service and accounting staff will work hard to complete the process as quickly as possible. The item "Wisco 412-5-NCT Counter Top Commercial Electric Pizza Oven 12 Frozen Pizzas" is in sale since Friday, January 6, 2017. This item is in the category "Business & Industrial\Restaurant & Food Service\Commercial Kitchen Equipment\Cooking & Warming Equipment\Ovens & Ranges\Pizza Ovens". The seller is "acitydiscount" and is located in Oregon, Wisconsin.